Having a best friend is one of the most rewarding things one could own. 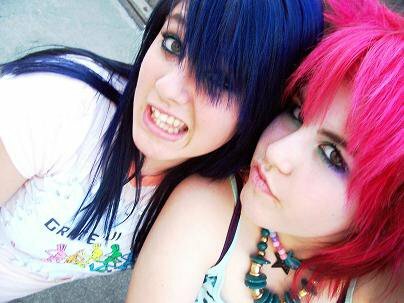 Pardon me, but this post will be illustrated with quotes about my best friend, Katrina, if you don’t mind. Or the super attractive pictures. 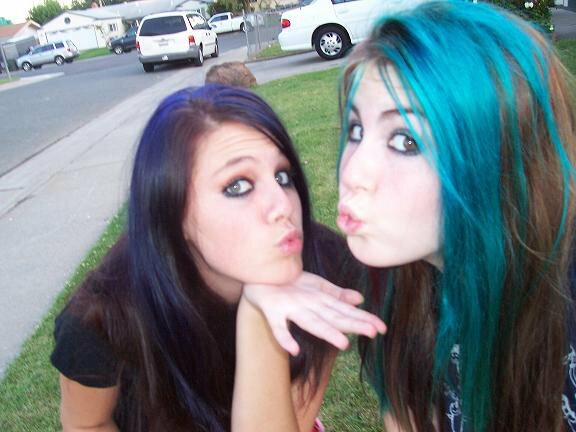 I met Katrina on the first day of the fifth grade. I arrived bright and early to Mrs. Blanton’s class and found myself a seat I liked, right in the middle. And then I saw him–this gross boy that I knew for a fact picked his boogers and ate them and smelled like chicken noodle soup. I did not want to sit next to him–such a thing would be social suicide for one, and for two, boys have cooties. Every girl knows this. In my desperation to have someone–ANYONE–sit next to me instead, I glanced at the incoming students and spotted Katrina. I’d known her name from some mutual friends but had never spoken to her. My absolute dire fear of sitting next to Booger Boy was so strong that I impulsively shouted her name, “KATRINA!” and waved, hoping she’d sit next to me. And honestly, the rest is history. Maybe it was because we were both desperate to avoid Booger Boy, but turns out, we had a lot in common. We had a serious love for N*Sync and the Spice Girls. We obsessed over every copy of J-14 magazine. And we collected Lip Smackers like lip balm fiends. Seriously–it was crazy how many Lip Smackers we had combined. We collected them and logged the flavors in separate journals where we also brainstormed future Lip Smacker ideas. Bonne Bell should have contacted our 10-year old selves because we had some rockin’ ideas. And then we discovered her dad’s video camera. And honestly, if you could see some of the hideous faces, weird dance moves, and crazed psycho-babble of us growing up through adolescence… well, you’d be moderately shocked. Kind of weirded out. And most likely horrendously embarrassed for the both of us. Those home movies, which we affectionately-yet-oddly call “Bumz Under Carz” (don’t ask) are the pinnacle of our friendship. It describes our personalities perfectly: highly imaginative, creative, curious and crazy, but also spontaneously fun and enjoyable people who apparently like to dance and contort their faces as ugly as possible. But if you have a best friend, you know that you could probably turn to them one day, ask them what their prescription ear drop medicine smells like, and you’ll know the person you’re asking is your best friend when she responds, “Your ear drops smell like the word ‘mute. '” Even better, you’ll know she is your best friend because despite the oddball answer of describing the SMELL of something as the word ‘mute’, you actually agree. I just think we have super-human best friend powers is all. Forreal, though–Katrina and I have the uncanny ability to identify ANY smell. Or determine what animals or cartoon characters certain people look like. Someone should pay us for our services of awesomeness. The best part is, even after all these years and the fact that naturally, our maturity ages a bit like a fine wine, we STILL have fun laughing endlessly over Bumz Under Carz, the mute-smelling ear drops, and other crazy-fantastical stories and inside jokes we have. And we still find the same things hilariously funny. It means a lot when someone doesn’t look at you weirdly when you’re saying that a certain musical instrument sounds like raindrops on a snowy day–because she thinks the exact same thing. It’s Katrina’s twenty-first birthday and I just had to do something special for my BFF (besides being her awesome BFF). I got her a bunch of killer stuff I cannot disclose due to the fact that she has yet to open the bulk of her adorably-wrapped gifts, but I will say that I had the PERFECT dessert idea for her. We both have the same mutual adoration for anything bubblegum-flavored, so I made my signature amazing rainbow cupcakes… but with a hefty dose of bubblegum. Most may think it was obnoxiously gummy… but to us, it’s perfect! And since it’s the big 2-1, I had so make something super sweet for my super sweet friend. 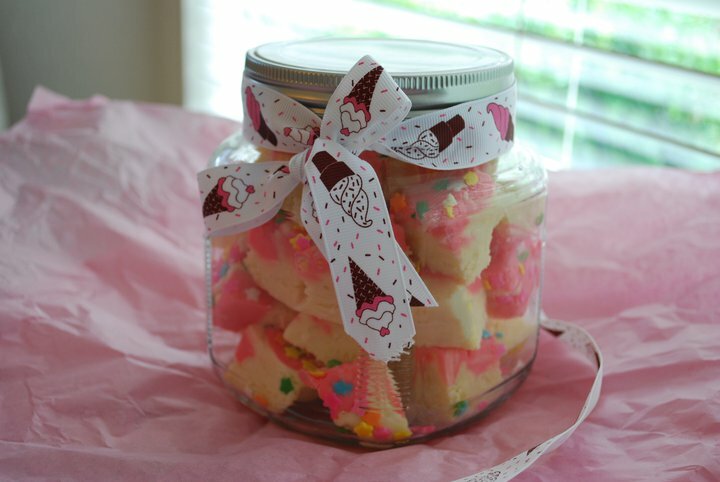 This birthday cake fudge, courtesy of the amazing Kristan from Confessions of a Cookbook Queen does the trick. It’s richly sweet, perfectly pink, and tastes like a birthday cake…but in fudge form. Plus, it’s sprinkled with stars, which perfectly epitomize my awesome pal (and goes with the corny quote). Plus, it’s easy to make. Wanna know how to have your cake and eat it in fudge form? 1. Line a 9-inch pan with foil, allowing the ends to hang over the sides of the pan. Thoroughly spray foil with cooking spray. 2. In a large saucepan, combine sugar, butter and evaporated milk on medium heat. Bring to a full rolling boil, stirring constantly and boiling for exactly four minutes. Keep stirring– if you stop, the mixture could scorch. Remove from heat. 3. Stir in marshmallow cream, white chocolate and cake mix until thoroughly combined and chocolate has melted. Stir in vanilla and mix well. 4. Working as quickly as possible, pour about 1/3 of the fudge into a medium bowl and add pink food coloring, mixing and tinting until you get your desired shade. Pour the remaining batter into the prepared foil pan and spread evenly. Drop spoonfuls of pink fudge on top of the white fudge, spacing it out. 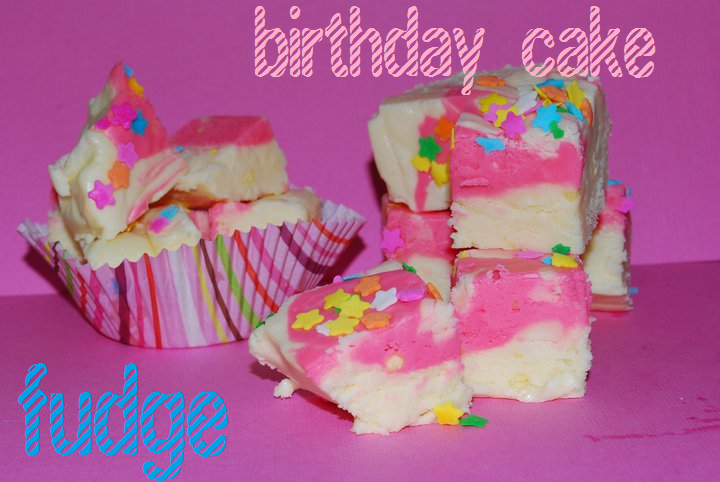 Using a butter knife, swirl the pink fudge into the white fudge, creating a marbled pattern. Sprinkle with rainbow sprinkles or star quinns, if desired. 5. Allow fudge to sit at room temperature or chill until fudge has set. Cut into squares, and store at room temperature or in a cooled area. Enjoy! Or, if you’re using this fudge as a sweet and tasty treat like I am, you can wrap it up into a cute jar and tie it with a fancy ribbon. Adorbz! Isn’t that ribbon cute? Michael’s dollar bin, baby!